Subscribe to Ageless Paws Now! – or save 5% with autoship! Ageless Paws Salmon Bites freeze dried treats for cats are a healthy way to indulge that personality-rich feline companion of yours. Made solely from fresh raw salmon, these freeze dried healthy cat treats are free of artificial ingredients, additives or fillers. Naturally grain-free, they deliver nothing but the delicious nutrition of wild Atlantic salmon. Freeze drying maintains the freshness and nutritional integrity of the salmon, so you can always have treats on hand of the highest quality, and produced with the strictest food safety standards. Dr. Sinatra, a physician and certified nutrition specialist and cat lover, believes it is important to choose only the healthiest cat treats for our beloved companions. He likes wild salmon for both people and pets because of its coenzyme Q10 and omega-3 fat content. That is why he hand-selected this delectable freeze dried healthy cat treat – because it is made with nothing but wild Atlantic salmon – something you can feel purr-fect about giving. Salmon Bites Freeze Dried Treats for Cats Feeding guidelines: Treats should make up no more than 10 percent of your cat’s daily calorie intake. These freeze dried healthy cat treats are not a substitute for kitty’s main meal. They are for intermittent or supplemental feeding only. These freeze dried cat treats are made from fresh, raw fish. Handle with care – keep in sealed package and wash hands after handling. I received these a couple of days ago, and my finicky cats wouldn’t eat them, but then they won’t eat chicken that’s been roasted or baked for dinner either. However, took to my son’s and his cat, Einstein, would’ve ate the whole bag if he was allowed to. I wish I could get my cat’s to eat treats, especially something made with such wholesome ingredients as these, but they have just never been interested. I have a senior cat that won’t eat fish or chicken I make, or eat more than a bite or two of wet food. She’s super picky and for the most part eats nothing but dry food, and some dry treats. To my surprise, she likes these treats!! We got a free sample and tried them out and she enjoys 3 or 4 pieces at a time, even licked the little bit of powder I poured from the bottom of the bag off my hand. Thanks, I’ll be ordering more! My cat isn’t finicky, he doesn’t get table food, only dry cat food, but I wanted to give him healthy treats instead of the usual 2 or 3 brands he gets & likes at bedtime. I sent for a sample of these and he kept looking around on the floor to see if there were more and crying for some! I’m ordering him a bag and will try to wean him off the others. *Reviewer received a free sample of these salmon freeze dried cat treats. My cats wouldn’t eat this. Smells good! Wish they liked it. *Reviewer received a free sample of these salmon freeze dried treats for cats. I received a free sample and gave my 2 cats the treats ASAP. They did not care for it. One licked it then just left it in the bowl. I’ve tried 2x so far and she won’t eat it. The other ate it since she was hungry and I had it mixed with her regular food. These are not extremely picky cats. They love fresh grilled salmon, wet food, dry food.. they eat grain-free mostly. although my cats liked these, they were a bit awkwardly sized or shaped, the cats wanted to eat them. I ended up just crushing them into powder and sprinkling on their food. My husband requested a free pack of the salmon bites and our Treeing Walker Coonhound can’t get enough! I received a free sample of the salmon bites. My cats LOVED these treats. I guess I am going to have to place an order for them because they actually tried to open the package after I closed it. Thank you for the sample, and for such a good product! Prince Logan devoured these salmon bites. He’s a picky eater, so for him to live them so much, is a great thing!!! They don’t have that cheap cat food smell! Easy to serve. some of the cats like it but not others… so so reaction. Sign up for Exclusive Ageless Paws Offers! We're excited to have you join our AgelessPaws.com newsletter list! 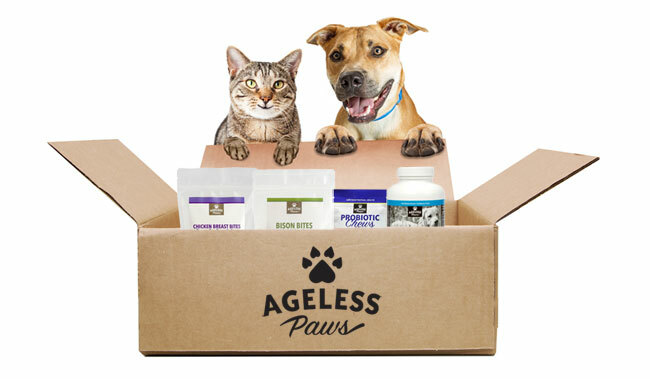 Sign up today to receive exclusive Ageless Paws offers, news, and blogs, and get a coupon for 10% off your first order!